Surprise your guests for a patio cookout with this Russian-style potato salad. 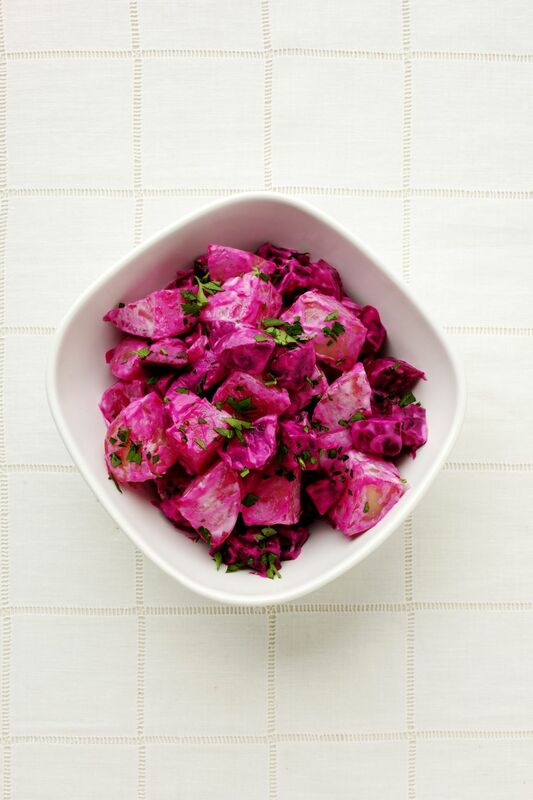 Beets add the Russian flair, and carrots and mustard also contribute to its offbeat flavor. Make it the day before to let flavors blend but add the beets just before serving. This recipe is courtesy of the former executive chef Andre Guerrero of the now-closed Linq Restaurant in Los Angeles. Boil the potatoes, beets, and carrots in separate pots until tender. Drain. Peel and dice the potatoes and beets. Place the potatoes and carrots in a large bowl to cool. Place the beets in another bowl; refrigerate until ready to serve the potato salad because the beets will color the potatoes and carrots if mixed in. Add the celery, red onion, pickle relish, and parsley to the potatoes and carrots and mix well. Combine the mayonnaise, wine vinegar, olive oil, mustard, salt, and pepper. Add to the salad and mix gently with a rubber spatula. Refrigerate the salad for several hours or overnight to let the flavors blend. Add the beets just before serving. This non-traditional take on an American favorite for summertime meals could be served with the usual suspects: burgers, steaks or hot dogs. But because of the strong flavor of the beets, pork main dishes might be a more palatable pairing. Try brats, grilled pork chops or grilled pork tenderloin, done to a turn. Usual summer vegetables for sides, like tomatoes, also clash with the flavors of this potato salad. Instead, serve a cold green bean salad made with fresh beans, red onion, bacon and vinaigrette dressing or a fresh green salad with red onions and vinaigrette to harmonize with the beet potato salad. Choose a light rose wine, a cold, dry white like chardonnay or a medium-bodied red like Zinfandel, Cotes du Rhone or Grenache. A red blend featuring Syrah, Shiraz or Grenache would also make a tasty pairing. For dessert, think fruity. If homegrown peaches are in season, end this summer meal with peach crisp topped with vanilla ice cream, grilled peaches with honey topped with mascarpone cheese, peach cheesecake or that all-time summer favorite, fresh peach pie. If blueberries are more your style and in season, make a grand finale of blueberry bundt cake, crepes with blueberry and cream cheese filling or lemon blueberry cake with white buttercream frosting.